Saturday night was a much better night for the New York Ranger and New York Islander prospects as we had two 3 point games, two 1st stars and an "excuse me" goal that sealed a win. All in all a fun night of hockey even if not everyone won their games. OK so I am very partial to players who are 5'7-5'8 (since I am 5'7 1/2) and it annoys the heck out of me when I see a solid player's potential described with "if he was 6"1 or taller" as Taylor Cammarata (NYI 2013 3rd) of the Minnesota Golden Gophers can flat out play. Ask Notre Dame as it was Cammarata who ruined their chances at earning a weekend sweep. Cammarata with a 1-2-3 night helped top ranked Minnesota edge 4th ranked Notre Dame 5-4. The game's 1st star Cammarata was a one man wrecking crew starting with a power play goal at 7:46 of the first period which gave Minnesota a 1-0 lead. Cammarata's speed opened the door for him to skate away for the Notre Dame defenders and skate from behind the net to tuck the puck in for his 3rd goal of the season. Cammarata would earn his 1st assist of the game when he was credited for a secondary assist on Minnesota's 3rd goal at 15:04 of the 1st period giving Minnesota a 3-1 lead. His 2nd assist was game changer as he fed fellow Islander prospect Jake Bischoff for a goal at 8:57 breaking a 4-4 tie. It would turn out to to be the game winning goal as Minnesota earns a split and perhaps keeps the top spot in the polls. Cammarata is 3-6-9 in his freshman season. Anthony Duclair (NYR 2013 3rd) had himself a 3 point game to help his Quebec Remparts earn a 5-2 win over the Rouyn-Noranda Huskies. It was the 3rd time this season that Duclair posted 3 or more points in a game and this is just after 20 games. The game's 2nd star, Duclair got his evening going when he set up Alexandre Boivin for Boivin's 2nd goal of the season and a 2-0 Quebec lead at 7:25 of the 2nd period. Duclair wasn't done as he would give Quebec a 3-0 lead at 12:15 still in the 1st on his 17th goal of the season. That goal would turn out to be the game winning goal which is Duclair's 4th of the season. Duclair would finish his night with his 18th goal of the season, an empty net goal at 19:26 of the 3rd period. 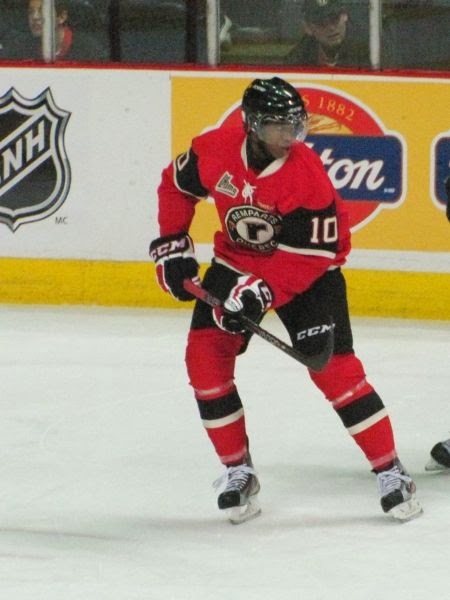 Duclair's 2-1-3 +4 improves his numbers to 18-9-27 which is very impressive even in the QMJHL. Duclair is 12th in overall scoring, 3rd in goals with 18, 9th with 6 power play goals, 8th with 2 shorthanded goals, and 4th in game winning goals with 4. Duclair still needs work on defense as well as consistency but for a franchise starving for offense, Duclair his helping his cause here quite well. The Plymouth Whalers may not be winning but Victor Crus-Rydberg (NYI 2013 5th) has been trying his best to stop the bleeding. The game's 1st star in a losing cause, Crus-Rydberg had a goal and an assist as his Whalers lost via the shootout 4-3 to the Windsor Spitfires. Crus-Rydberg's 4th goal was Plymouth's 2nd and his assist was on their 3rd goal but the Whalers are 3-6-0-1 while Crus-Rydberg has been 2-9-11 in the same span. Crus-Rydberg has been adapting well to the North American game but he can't do it alone. I am not sure why Minnesota coach Don Lucia has only been using Jake Bischoff (NYI 2012 7th) on Saturday night games. In his last 3 games, Bischoff is 2-1-3 including the goal in the 3rd period that proved to be the game winner against Notre Dame. If it was me I would be playing Bischoff on Friday nights too. Bischoff scored on the power play at 8:57 of the 3rd period breaking a 4-4 tie. Brady Skjei (NYR 2012 1st) was scoreless on 1 shot and a +1 against Notre Dame. Minnesota's defense was way better than their 4-1 loss on Friday night. For Notre Dame Robbie Russo (NYI 2011 4th) had a secondary assist on what at the time was the game tying goal (4-4) with just 2 seconds left in the 2nd period. It was Russo's 5th assist on the season as he was 0-1-1 on 3 shots and a +1. Steven Fogarty (NYR 2011 3rd) was scoreless on 1 shot and a -1. Kyle Burroughs (NYI 2013 7th) was trying to clear the zone when he fired the puck out but the captain of the Regina Pats caught a break and the puck went in for an empty net goal. Burrough's 1st goal was the dagger as his Regina Pats defeated the Seattle Thunderbirds 5-3. I will be seeing Burroughs in Portland Oregon on Sunday so it will be interesting to meet him. Burroughs is now 1-16-17. Adam Pelech (NYI 2012 3rd) was scoreless but a +3 while teammate Troy Donnay (NYR 2013 UFA) was scoreless and even. Their Erie Otters defeated the Sarina Sting 7-1 as the Otters have won 11 out of their last 12 games. Jesse Graham (NYI 2012 6th) was scoreless as his Niagara IceDogs were defeated by the Oshawa Generals 5-3. Not much more can be added to this one. Loic Leduc (NYI 2012 4th) was scoreless on no shots but he did record a hit as his Cape Breton Screaming Eagles defeated the Shawinigan Cataractes 4-2. Griffin Reinhart (NYI 2012 1st) and his Edmonton Oil Kings won 3 straight games with shut outs only to find themselves shut out 2-0 by the Kelowna Rockets. Stephon Williams (NYI 2013 4th) was the back up goalie as his Minnesota State Mavericks defeated the Bowling Green Falcons 1-0. Mackenzie Skapski (NYR 2013 6th) remains out for his Kootenay Ice with a lower body injury. Adam Tambellini (NYR 2013 3rd) missed Saturday's game for North Dakota and will be expected to miss Sunday's matup as well. Tambellini is out with an "Undisclosed injury."